Here in Wisconsin we’ve recently been blessed with a few days of warm weather. This is a rarity for us as we’ve battled an extra long, cold winter and early spring so I wanted to take advantage of the warmth and spend some time outside with the kids. 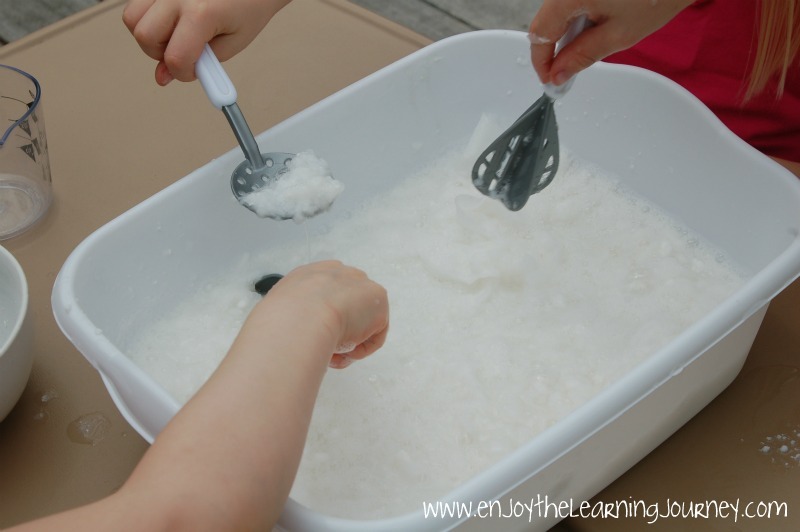 Making Clean Mush has been on our list of “activities to do” for quite some time and I was just waiting for a nice warm day to do it! Technically you can do this activity inside but I wasn’t brave enough for that. So once we got the chance, I took the kids outside for a little sensory exploration and color mixing lesson. Afterwards, the biggest surprise for me was that our 6-year-old enjoyed this activity even more than our 3.5-year-olds did. 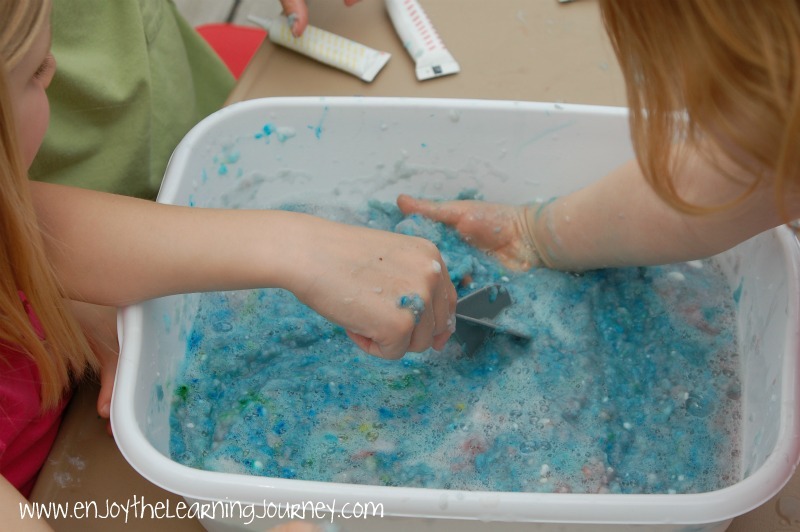 He really liked getting his hands into the mush and exploring as he mixed various colors together. 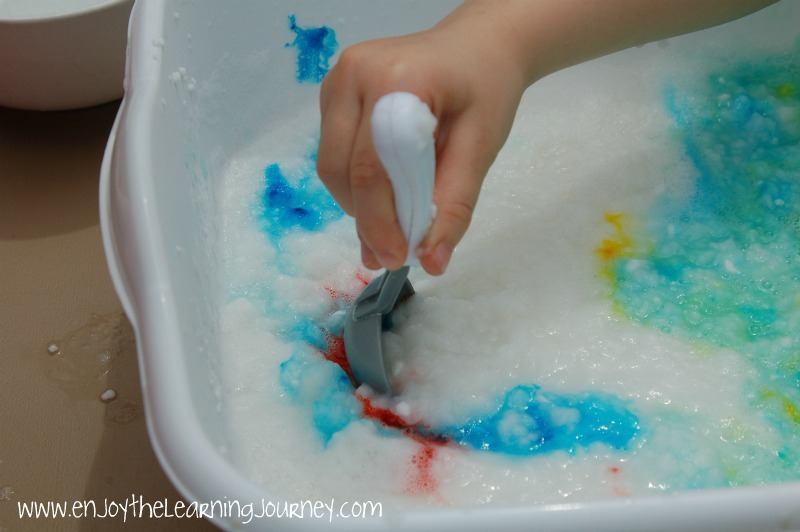 I know this type of activity is often suggested for toddlers but I think it can definitely be appropriate and useful for older kids when you include a color mixing lesson with it. Big kids like to get their hands dirty too (or in this case “clean”)! 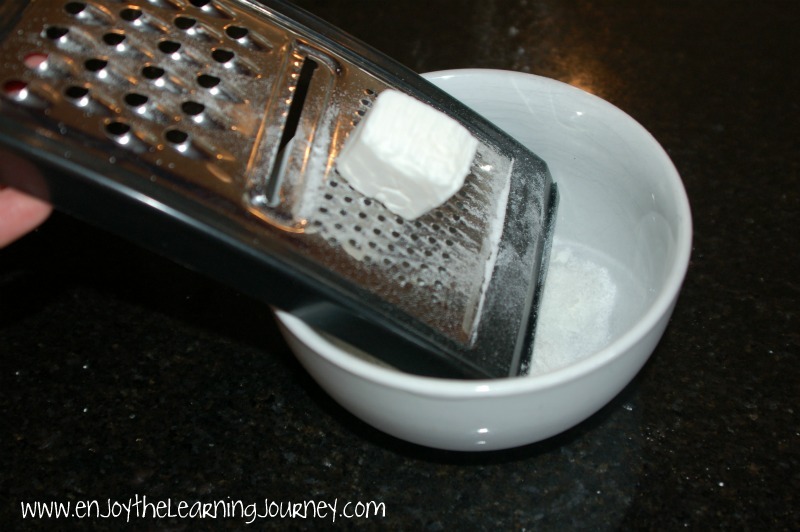 STEP 1: Grate the soap with a cheese grater (I previously purchased one from Dollar Tree to be used for these types of activities). 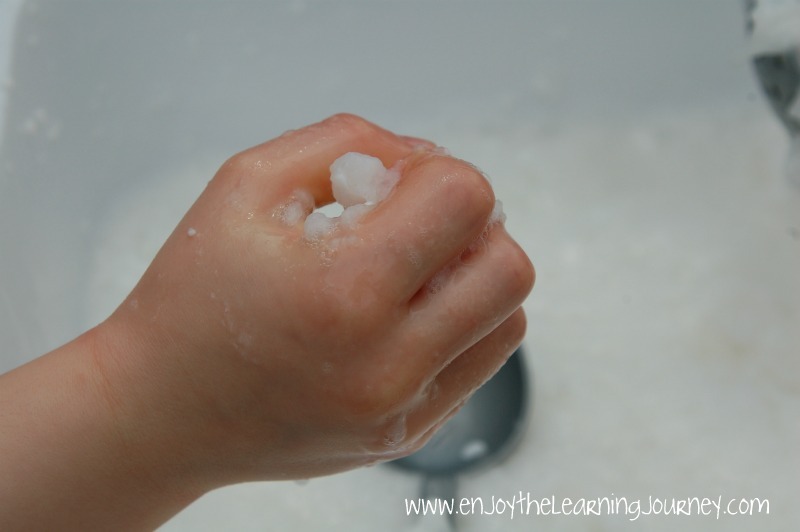 *I grated the soap rather than having the children do it. They completed the rest of the steps on their own (mostly). 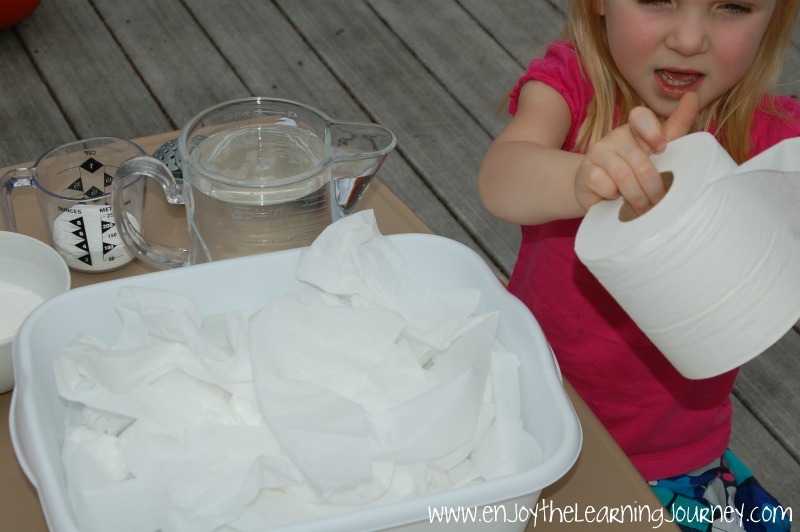 STEP 3: Have your child unroll the toilet paper and put it into the dishpan. 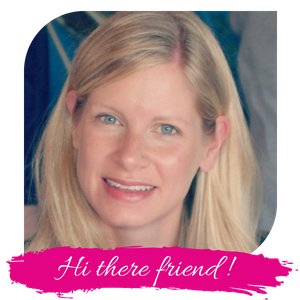 Unrolling the toilet paper roll can be very entertaining for little ones so encourage them to have fun with it! (We started out using about 1/2 of a very large roll). 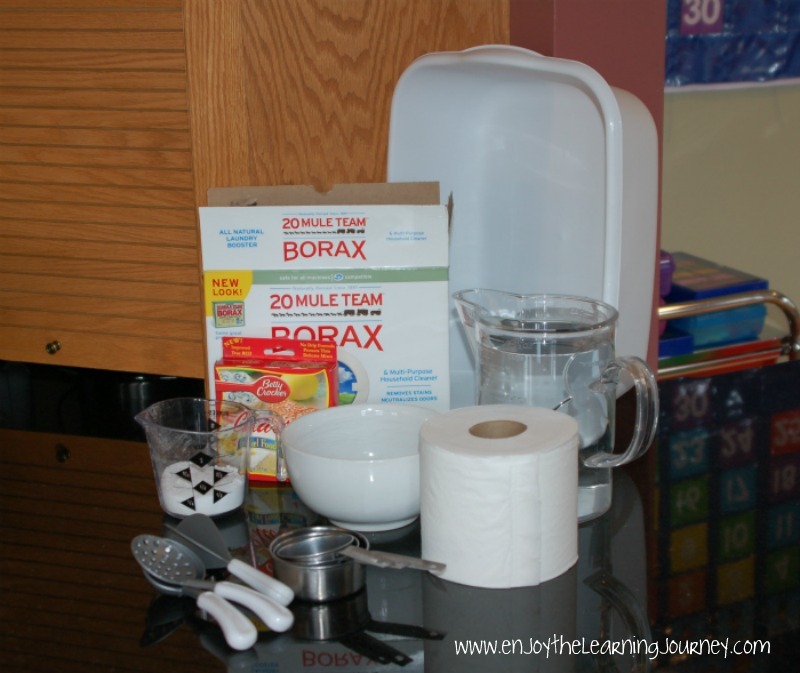 STEP 4: Pour the Borax over the toilet paper. STEP 5: Pour in the water. We used about 8 cups because I wanted it to be fairly watery to start out. 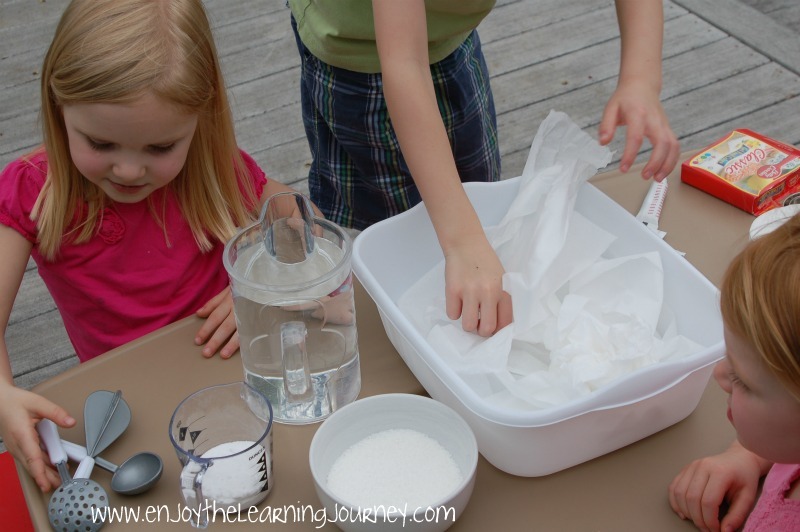 STEP 6: Have your children explore with mixing tools and cups. STEP 7: Encourage your children to also explore with their hands. STEP 8: Squeeze food coloring into the mush for a color mixing lesson. We started out by mixing blue and yellow = green and blue and red = purple. STEP 9: Allow your children to explore further. 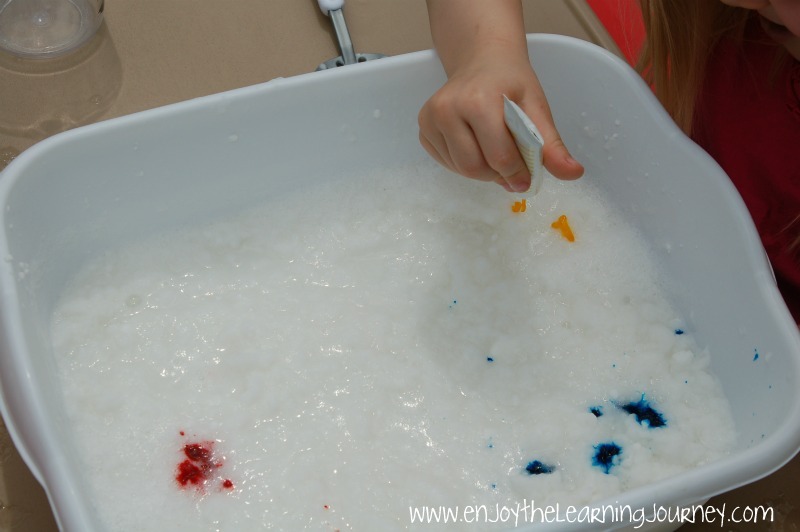 Our mixture kept changing as the kids continued to mix in additional food coloring and additional toilet paper. 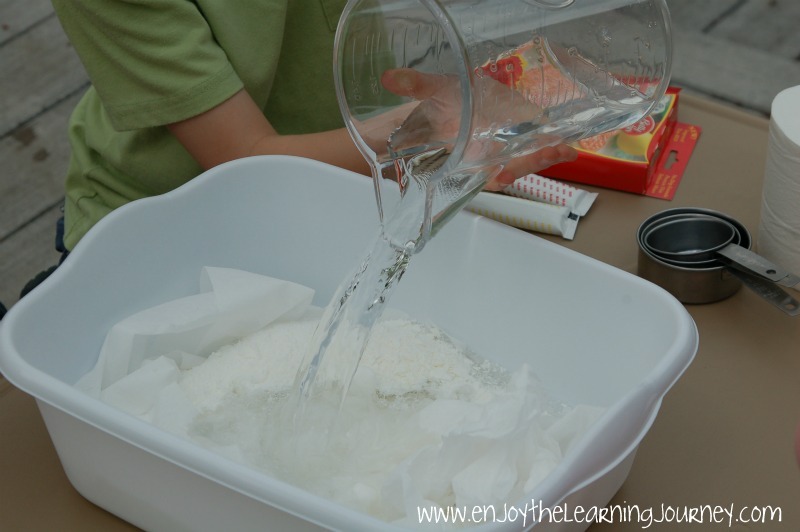 STEP 10: You can see in the picture below that by the end the mixture firmed up a lot due to the additional toilet paper the kids kept adding. It also looked pretty gross! 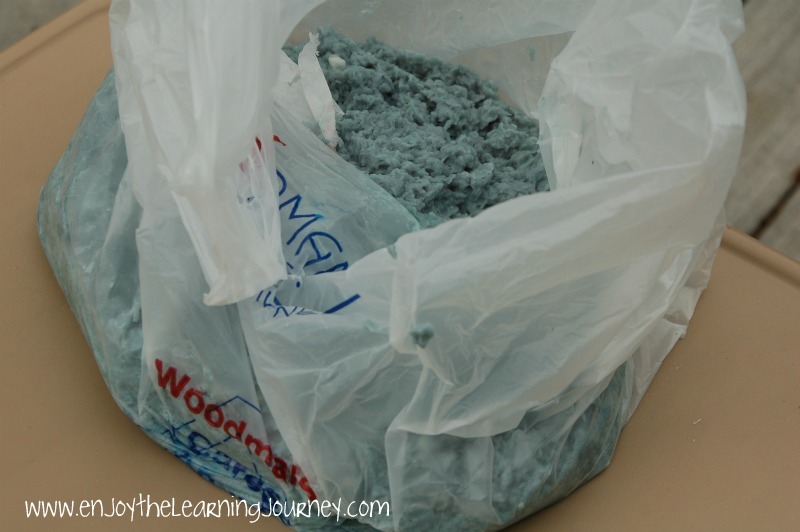 But it was easily transferred to a plastic bag for disposal. 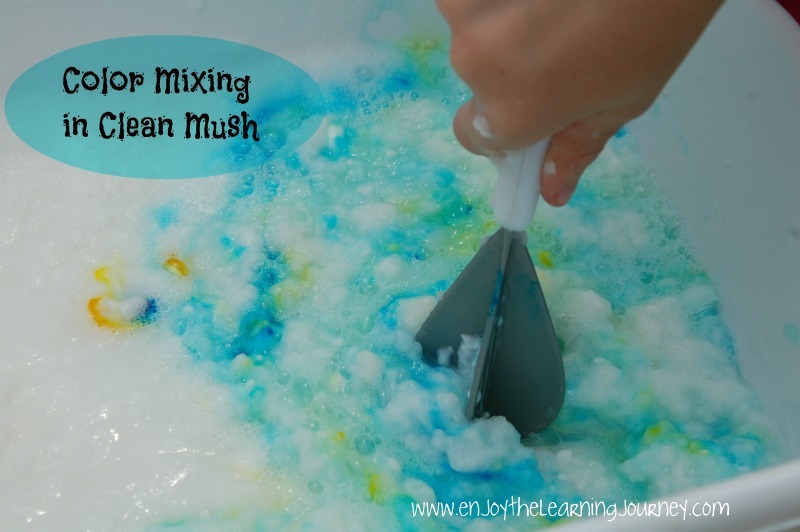 Some people choose to make Clean Mush that is much more firm than ours was so feel free to adjust the amount of water and toilet paper depending on the consistency you and your children want. 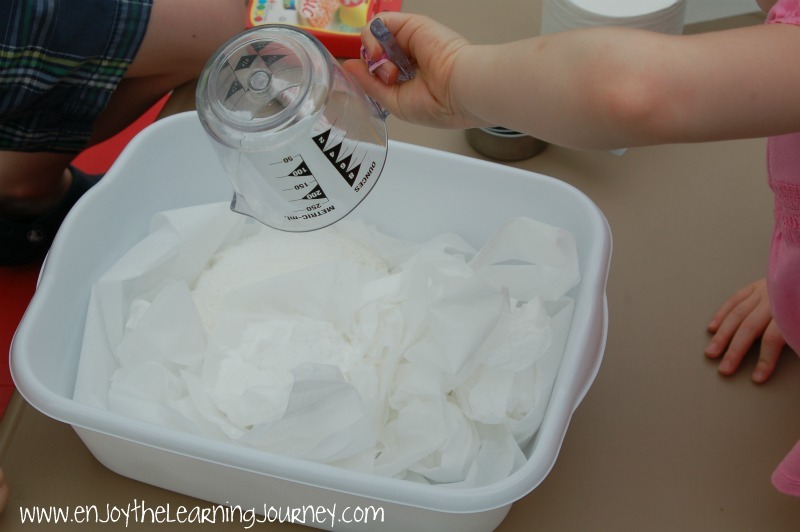 I found it interesting to start out with it watery and allow the children to explore and see the change as they added more and more toilet paper. But please do whatever works best for you!